Training camp is just around the corner. It’s a joyous time of year for football fans as they get to see their guys in full pads for the first time this year, and get their first look at the fresh faces as preseason games get underway. A few days ago, we took a look at the guys on the bubble of making the final 53-man roster for the Ravens offense. Today we take a look at the same for the Ravens defense. Discuss your thoughts on this topic on our message board. Click here through July 31st to see how you can help BSL grow and support four great local charities. DT – Terrence Cody: Cody’s career thus far in Baltimore has been a disappointment. 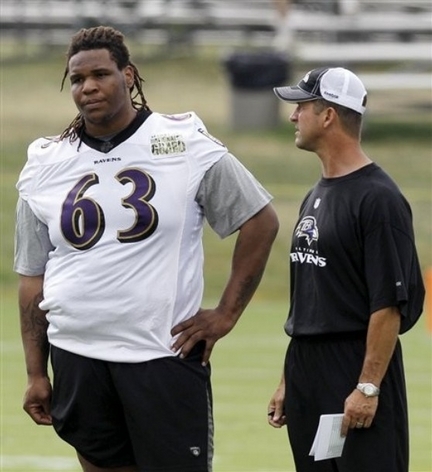 When the Ravens drafted the 340 pound mountain of a man, they had hopes of he and Haloti Ngata being a couple of mammoths in the middle like Tony Siragusa and Sam Adams used to be, that let Ray Lewis roam the field at will. Cody’s weight, and health has been an issue since day one. You can be a big guy as long as the strength matches and it hasn’t been there for him. This camp he will start on the PUP list as he recovers from hip surgery. He can return to action anytime during training camp, but if he doesn’t recover in time for the season to start, the Ravens may just cut bait rather than carry an injured Cody into the season. DE – Kapron Lewis-Moore: Here is a guy that the Coach Harbaugh mentioned wanting to have an impact this upcoming season during the Ravens State of the Team Address some months back. Problem is, There are only so many roster spots, and even less in a 3-4 defense where DEs and DTs combined for just six spots on the 53-man roster a year ago. If you figure the four DTs expected to make the team that leaves just two DEs, unless they were to trim some fat elsewhere, which I’ll mention coming up next. The dead money for cutting Lewis-Moore is minimal, just $66K. OLB – John Simon: It’s a shame because Simon does all of the right things, and says all of the things you want to hear a football player say. Simon’s first day as Raven when visiting the complex he asked where the gym was so he could get his lifting in. He was Urban Meyer’s favorite player at Ohio State and has a real high motor. He’s almost a one trick pony though as he made a living in college off of rushing the passer, but open field tackling isn’t his forte. Simon was a healthy scratch often last season. The Ravens carried five OLBs, but with Simon being left off the dress list, or relegated to special teams, they could carry four OLBs in order to get seven men on the defensive front depth chart. I imagine It’s between Lewis-Moore and Simon on the bubble of the 11 spots divvied up between DT, DE, and OLB. CB – Asa Jackson: Jackson looked to be another diamond in the rough the Ozzie Newsome found when he was making plays left and right in 2013’s preseason. He did have to serve an eight game suspension for violating the league’s PED policy (Adderall). Following the suspension we hoped to see the player that shined during the preseason but that wasn’t the case at all. In fact, we didn’t see much of Jackson. The fact that the Ravens went out and signed two veteran corners in Aaron Ross and Dominique Franks, lets you know how they feel about their depth at the position. I’ve heard more good about Chykie Brown this offseason than Jackson, which is why I put Jackson on the bubble. Undrafted CB Samuel Seamster is getting some notice as well.